5,000 lines, yet as thin as a human hair! 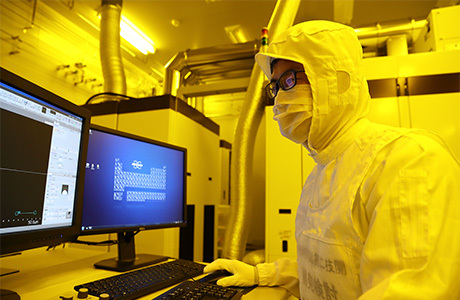 semiconductor manufacturing is close at hand. These days, semiconductors are an essential part of our lives. Semiconductors consist of “wafers” (substrates) that are densely printed with incredibly tiny electric circuits that instill them with such technological functions as memory, logic (computing) and sensor functions (recognition). Semiconductors are all around us, in everything from our smart phones and personal computers to our home electronics and automobiles. They are also crucial elements in such current trends as the burgeoning Internet of Things (IoT) and the ever-evolving AI systems that are drawing attention in a number of fields. Until recently, the miniaturization technology has improved by leaps and bounds. In recent years, however, the physical limits of this process have become evident. In search of ways to overcome the barriers of miniaturization, a method has emerged that allows circuit patterns to be created by pressing (imprinting) a nanometer-scale* mask onto the substrate in a process called “nanoimprinting.” In departing from conventional methods that are approaching their technical limits, Canon is ushering in a new era of miniaturization by developing the world’s first mass production equipment based on a completely innovative technology. This equipment, the “FPA-1200NZ2C”, is already being used by Toshiba Memory, a leading manufacturer of semiconductor memory. We sat down with some of Canon’s developers to ask them about nanoimprint lithography, the technologies behind it, how it differs from conventional methods and what kind of changes it will bring to our lives. Shinichi Shudo Has worked exclusively on designing semiconductor lithography equipment since joining Canon. Motto: When in doubt, take another step forward. Before we get into your explanation of nanoimprinting, please tell us about the role that semiconductor lithography equipment has played up until now. Atsushi KusakaTypically, semiconductor chips are made by taking a silicon wafer that has been slice cut into the shape of a thin disc, depositing a film on its surface, exposing that film to light, which develops the exposed film, and then injecting ions into it. That process is then repeated over and over again. 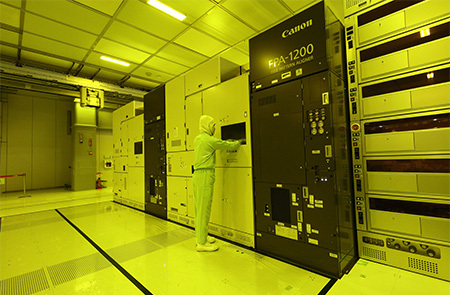 The equipment manufactured by Canon handles the exposure process of actually printing the circuit patterns to the wafer, which is one of the most important processes that impacts the miniaturization and productivity of semiconductor chips. Electronic circuits are designed which determine the functionality and performance of the semiconductor chip. The circuit patterns are transferred onto dozens of plates of glass. A disc-shaped wafer is prepared which will serve as the base of the semiconductor chip. 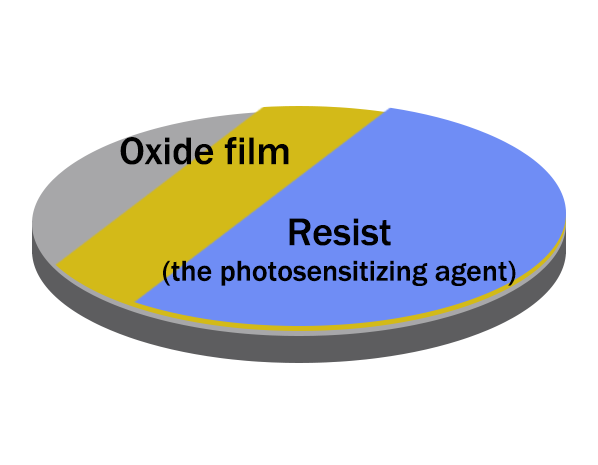 The wafer is heated to form an oxide film over its surface, and then the photosensitizing agent (resist) is applied. The master is exposed to light in order to transfer the circuit pattern onto the wafer. 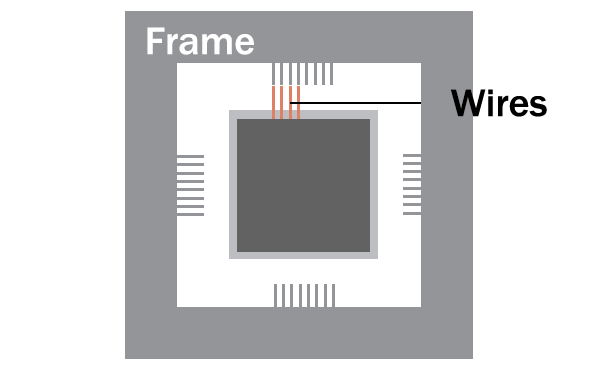 By focusing the light using a reduction lens, even finer patterns of circuitry can be transferred. 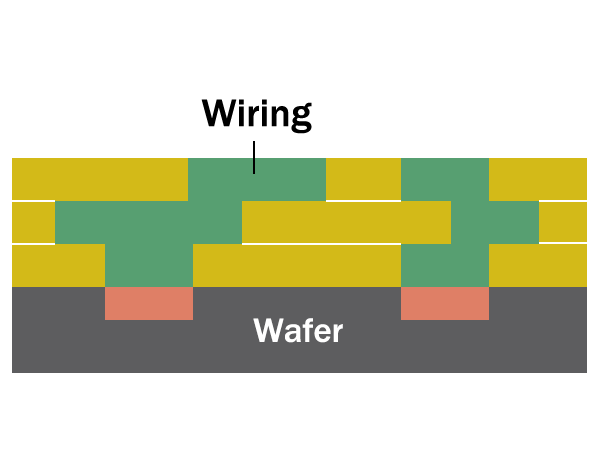 The narrower the lines in the circuit pattern, the greater the number of semiconductor elements that can be transferred, and therefore the higher the performance and functionality of the chip. 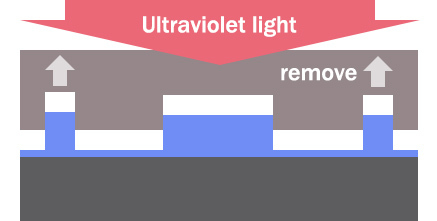 The resist undergoes change when exposed to light, and the exposed portions are removed using a developing solution. 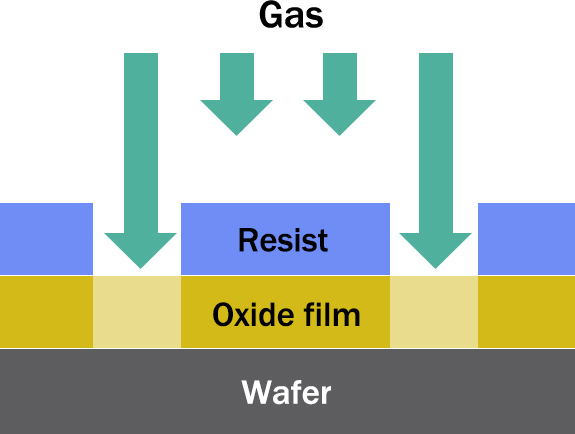 The sections of the oxide film that are not covered with resist react with a gas and are eliminated. 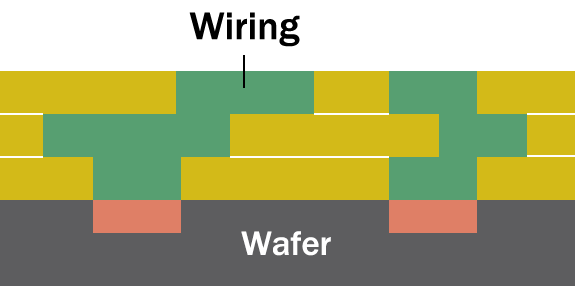 After excess resist has been removed, impurities that increase the transistor efficiency are injected into the exposed wafer to create semiconductor elements. 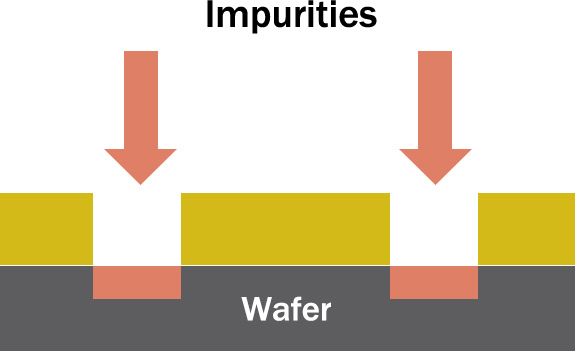 After the entire wafer is covered with an insulating film, the surface is flattened out. Then, the next layer is overlaid and more resist is applied to prepare for circuit pattern exposure. This process is repeated to form multilayered circuit patterns on the wafer’s surface, which are then connected by wiring. 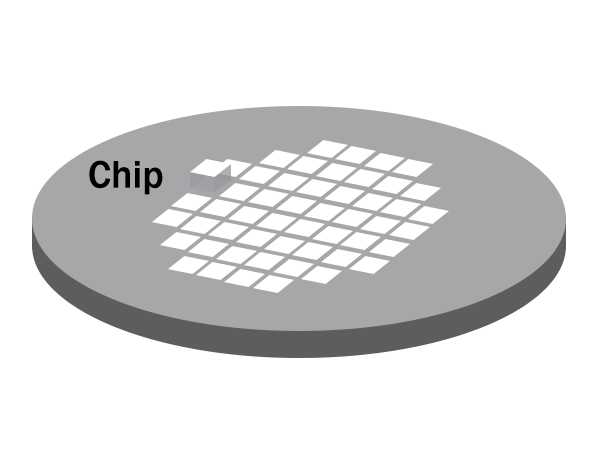 The semiconductor chip is cut out from the wafer. 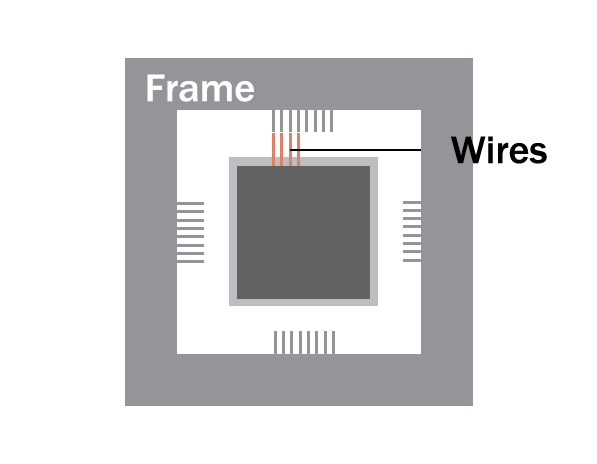 The chip is affixed to a frame and bonded to it with wires. The finished product undergoes inspection, and production is complete. How did the development of the nanoimprinting-based semiconductor lithography equipment come about? 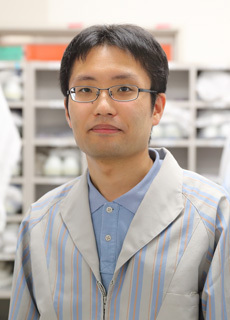 Takahiro NakayamaCanon first began developing nanoimprinting technology in 2004. At that time, the stagnation of miniaturization had become a topic of discussion both within and outside of the industry; everyone was looking for something that could replace conventional semiconductor lithography equipment. 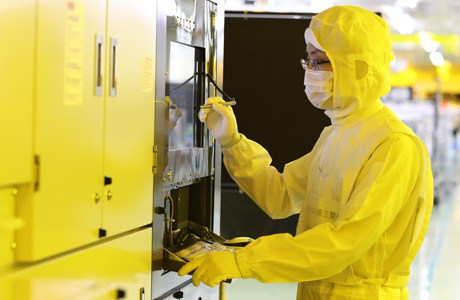 All of the equipment manufacturers were considering the use of EUV lithography, in which exposure is performed using extreme ultraviolet rays with a wavelength of 13.5 nanometers, or EB lithography, which draws circuit patterns using electron beams. However, both of these methods involved numerous problems, such as high costs due to their highly sophisticated mechanisms, which would make them very expensive, and the difficulty in achieving a desired level of productivity. Then, Canon became the first company to hone in on a simple, compact and low-cost method for making chips, known as nanoimprinting. The nanoimprinting development team had just been founded and, at first, it was an ultra-secretive project, even within the company. Finally, in 2014, it became widely known that Molecular Imprints, Inc. of the U.S. (now Canon Nanotechnologies, Inc.)?a company that had been developing the fundamental technology for nanoimprinting?joined the Canon Group. With this news as the impetus, the company as a whole as well as the global semiconductor industry, knew that Canon had decided to cast its lot with nanoimprinting. Could you tell us why you thought this method would be unattainably difficult, and explain the differences between nanoimprinting and conventional methods? Shinichi ShudoConventional equipment uses light beams to transcribe circuit patterns on wafers. The key feature of nanoimprinting, however, lies in that it impresses the circuit pattern on the wafer like a rubber stamp. 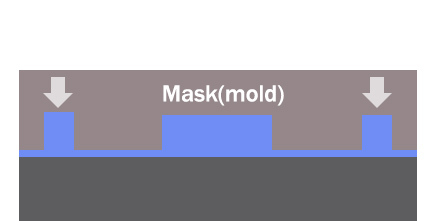 The pattern is created through the following process: The liquid resist (resin) is “coated” onto the wafer, and the mask (mold) is “stamped” on the resist so that the pattern is “overlaid”, and finally the mask is lifted off the resist (“mold separation”). This change from a contactless process to a contact-type process is the biggest difference from previous methods. 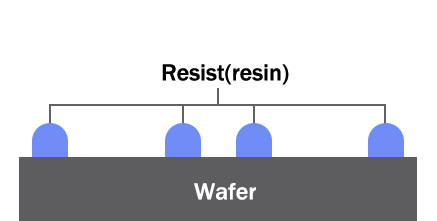 Using our inkjet technology, a liquid resin called “resist” is applied to the wafer based on the intended circuit pattern. The mold, called the “mask,” into which the circuit pattern is etched, is directly pressed, like a stamp, onto the resist-coated wafer. 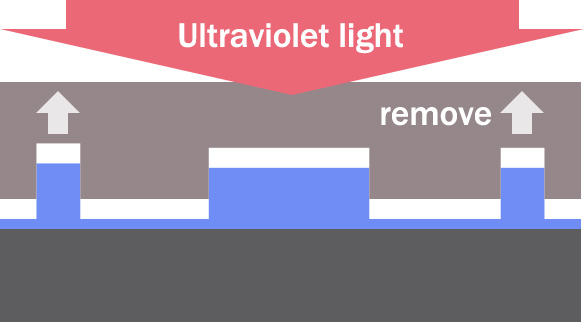 Ultraviolet light is used to solidify the resist, forming the circuit pattern. The mask is then removed from the resist. Takahiro NakayamaThe benefit of stamping using a mask is that we can imprint high-resolution, clean patterns all at once. Additionally, with nanoimprinting, we do not require light sources or the large-diameter lenses used in the exposure apparatus. This means the equipment itself can be simpler, more compact and less expensive. Since each piece of nanoimprint lithography equipment is smaller, it is possible to set up multiple units of it in an area of limited space and increase productivity. Masaki OgasawaraIn nanoimprinting, we make patterns on a nanometer scale. They say that a human hair is approximately 100 microns in diameter. Well, if we were to draw a circuit pattern with lines that are 20 nanometers apart, we could fit 5,000 of those lines within that space. It’s an incredible endeavor to create microscopic patterns using a “stamp.” Although, of course, it is totally different to an ordinary stamp. Atsushi KusakaThe masks used in conventional equipment are actually four times larger than the actual circuit pattern they are used to create. 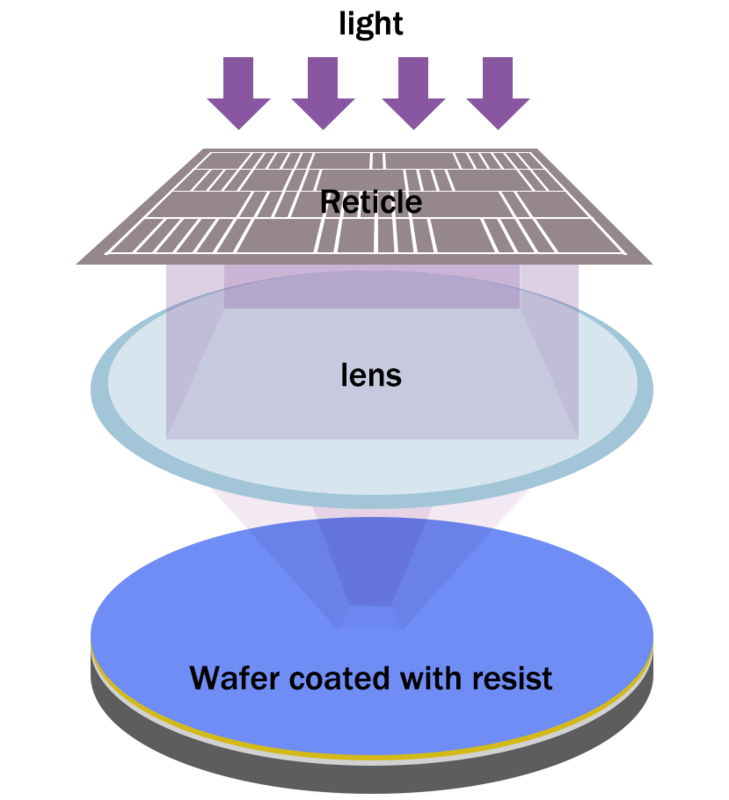 In that process, lenses are used to reduce the pattern to the size that is printed on the wafer. In this system, however, the mask is stamped directly onto the wafer, so the pattern is created at its actual size. To put it simply, the precision required is four times higher. As explained in the previous comparison with the hair, we are required to make the pattern with extreme precision. Likewise, a high level of precision is necessary just to align the position of the fine mask patterns with the wafer. What made you decide to take up the challenge of nanoimprinting, despite such difficulties? Masaki OgasawaraOf all the potential techniques that could replace the current methods for semiconductor manufacturing, nanoimprinting was found best suited to meet the needs of customers. Other methods may be used for similarly fine processes, but such equipment would incur tremendous costs. This means smart phones and PCs that use the resulting chips will also be very expensive. We feel that Canon’s development of nanoimprint lithography equipment will enable more people to use various products and services at lower prices. 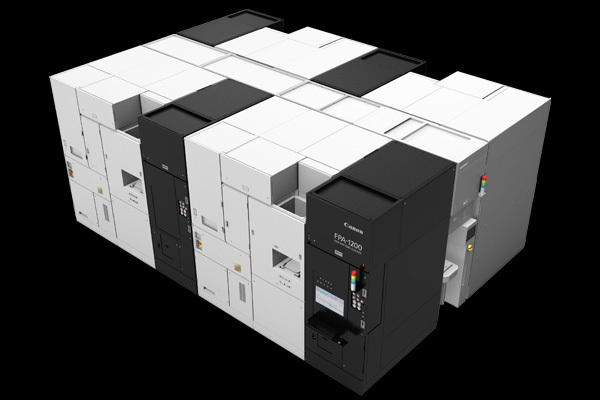 In addition, when we first started this development, Canon was in a tough position, lagging behind the competition in the semiconductor manufacturing industry. And so we also thought that if we were the first to put nanoimprinting to practical use, we could become number one in the industry. Development Story We encountered problem after problem along the way. 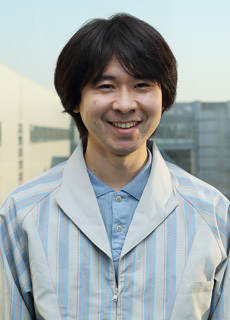 Takahiro Nakayama Element developer. Cooperates with other team members to solve issues like eliminating particles. Motto: Tomorrow is another day. How did you solve each of the issues you encountered as the actual development progressed? For starters, could you tell us about the resist coating process? Shinichi ShudoWith the equipment we had been using up until then, we had to coat resist evenly across the entire flat surface of the wafer. However, with nanoimprinting, we only need to apply liquid resist on the sections that need to be imprinted. Of course, controlling to make sure the resist is dispensed in just the right places was no easy task, but we were able to use the inkjet technology used in Canon printers for measuring and controlling the quantity and form of the resist to be dispensed. Masaki OgasawaraOne issue is when air gets in between the wafer and the mask during imprinting. I’m sure anyone who has ever tried to put a protective cover on a smart phone screen knows what I’m talking about; it’s not easy to do it nice and neatly. 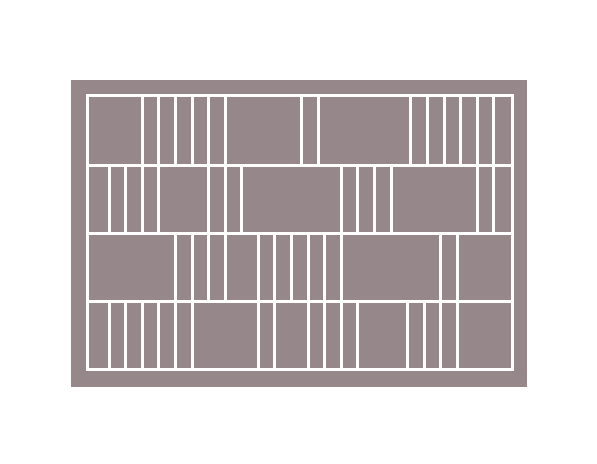 The same applies to nanoimprinting: if any air gets trapped between the wafer and mask, we cannot imprint the circuit correctly. Takahiro NakayamaWhile masks are in general very thick and hard, we decided to make the center part of our masks slightly thinner than the outer section, and to slightly bend the shape of the mask itself. Because of these changes, when the mask is stamped, the center part sticks to the wafer first, and then the adhered area spreads out radially until the entire mask is stuck. This means we let any air escape through the edges. Regardless of the state of the wafer, each imprint needs to be made at exactly the intended position. Even if all the wafers look the same to the naked eye, minute variations caused by some part of their manufacturing process will create significant differences at the nanometer level. During the development process, we realized that an attempt to imprint exactly the same pattern using one single mask on these slightly different wafers would not be possible. However, this would create problems for the customer, who might complain that “We could do it with the conventional equipment, but why not with nanoimprinting?” Then, we came up with a method of applying heat to the wafer only at the moment of imprinting in order to transform the wafer partially, on the nanometer scale, so that they match the mask exactly. In semiconductor lithography, conventional wisdom says that transforming the wafer with heat is something to be avoided, so this was quite a revolutionary idea. How did you go about adjusting the position and size of the pattern, which is essential for a clean overlay with no distortion? Atsushi KusakaSemiconductor devices are manufactured using a number of processes across a variety of equipment. New circuit patterns are drawn over the patterns produced in the previous step, and for more elaborate devices, these processes might be repeated dozens of times. 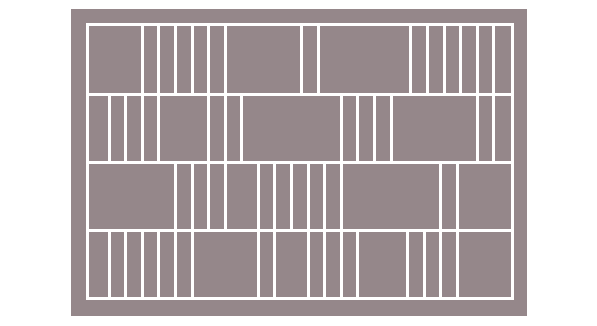 If the circuit patterns on the upper layers do not precisely align with those of the lower layers, the finished device will not function as intended. Furthermore, the lower layers of circuit patterns do not always maintain their ideal shape; they may have undergone numerous transformations during the manufacturing process. Therefore, the imprinting mechanism must be adaptable enough that it can be used regardless of the state of the lower layers. This precision combined with flexibility is called “overlay control,” and it is one of the important performance indices for the equipment used. First, we try to adjust the size and shape of the overall pattern. In the event that this fails to increase the precision, we must find the root of the problem. For instance, once the equipment has been running for a while, it may start to heat up or cool down, which will in turn cause the masks or wafers to expand or contract. Naturally, we try to account for this when designing the equipment, but when the actual results do not match our expectations, we increase the number of measurement points and re-check the obtained data. From there, we experiment by changing this condition or that, and keep feeding the data back into the process until we eventually find the optimal conditions. Masaki OgasawaraWhen the sizes were not matching well, we looked into whether there was a difference between the preset and actual temperatures. We control the temperature within a 0.02 degrees Celsius margin of error. I remember once being asked “Is the temperature really what you expected it to be?” We couldn’t just say “Yes, it is” and drop the subject. Instead, we intentionally tried changing the temperature and the measurement points, systematically zeroing in on the real cause of the problem by eliminating false ones. Atsushi KusakaWe place special marks on the masks and wafers to measure and adjust the overlay positioning. Since resist is viscous, it moves and transforms due to the force of coming into contact with the mask. This transformation also varies slightly according to the type and condition of the resin used. So, precisely compensating for these effects requires sophisticated techniques. Finally, please tell us about mold separation. Masaki OgasawaraIdeally, we would just pull the mask off the wafer all at once, keeping it parallel with the wafer’s flat surface. However, doing so would mean applying an extremely strong force when pulling off the mask, which might damage the wafer. So, we had to think of a way to pull off the mask without causing damage. We thought about peeling the stamp off diagonally, like flipping a page in a notebook, but doing this might cause the pattern, which was just imprinted on the wafer, to be flattened out by the mask’s movement. Masaki OgasawaraHere again, we decided to go against conventional wisdom: by intentionally lifting parts of the wafer up while tilting it, we were able to make the wafer and mask move like a pair of gears, allowing the two to separate while keeping the imprinted circuit pattern intact. We had always thought that the wafer should never be lifted, but this method, almost literally, flipped that idea upside down. What’s more, we have to be careful so as not to destroy the mask when eliminating particles. What exactly are particles, and why do they matter so much? Shinichi ShudoEarlier, we discussed how air could prevent a pattern from being correctly imprinted?another thing we have to worry about is the presence of particles. Particles are tiny bits of debris that could get in between the wafer and mask when the two are pressed together. This could destroy the pattern on the mask. Takahiro NakayamaAt a minimum, we must completely eliminate the presence of any particles with a diameter of 100 nm or greater. This is a much stricter standard than that used for conventional equipment. With our target set at such an extreme level, no measuring device even exists that can evaluate the target value. Therefore, our practical goal for now is to reduce the levels to slightly less than the lower-limit value that the most sensitive equipment available today can detect. Shinichi ShudoYou can’t see them, but you know they’re there. So, we had to figure out a way to get rid of them. That’s even harder than it sounds! Takahiro NakayamaWe started by trying to figure out exactly where the particles were coming from. The mechanical design team and I considered the potential sources of particles and whether we could eliminate them. Then we painstakingly set about reducing them one by one. Shinichi ShudoFor instance, in order to add an air conditioning mechanism to reduce particle levels, you first have to secure enough room to accommodate that mechanism within the limited amount of space available. This means having to move other components to other places, and even reposition the pipes. If that results in reducing particles, then great. But if doesn’t work out, then you’re back to square one. Ultimately, you’ve got to redraw those design blueprints again and again. Takahiro NakayamaEvery time we changed the design, the people at the factory were the ones who would actually have to put the new design together. This created a lot of extra work for everyone involved. Even so, when we were having trouble, we could explain what we were trying to do, and they would help us realize that and make progress. We also worked more closely with our subcontractors than ever before. Since this task was uncharted territory for everyone involved, such details as the selection of materials and methods of processing components might lead to an unexpectedly large increase in particles. Also, since these subcontractors often had their own subcontractors, we even had these sub-subcontractors share their materials lists and operation manuals with us. That really does sound like painstaking work! Shinichi ShudoThrough this, we found ways to reduce the presence of particles, but it was always by 1/100 or 1/1000 of the total amount. There were a lot of issues that couldn’t just be solved through dramatic technological breakthroughs. Takahiro NakayamaIncreasing the precision always meant running a simulation, then verification to see if the simulation results could actually be achieved; it was a cycle of painstaking work. Even so, before conducting a simulation you need an idea like, “Maybe doing this will improve that,” which will hopefully lead to the sort of revolutionary and innovative ideas we mentioned earlier. We repeated this cycle many times: finding a new issue, thinking about what we could do about it on our own while also sharing it with the related teams, and ultimately working out a solution with everyone’s help. We really felt like we were all in it together. Every day, we aimed higher than the day before, but we were able to keep working toward our goals by constantly giving each other advice and feedback. During the development process, you worked with Canon Nanotechnologies (CNT) in the U.S. What was the nature of this collaboration? 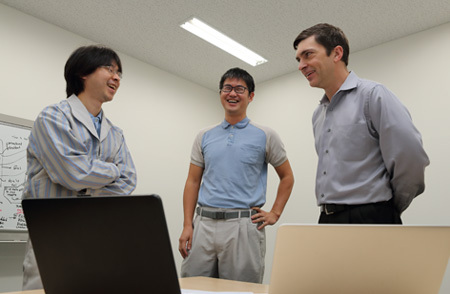 Meeting with the Canon Nanotechnologies staff Masaki OgasawaraCNT’s role was to develop the base nanoimprinting technology, while Canon worked on adapting it for mass-production equipment. CNT worked quickly and were flexible in their thinking. Working with them provided us with many opportunities to realize how hardheaded we were, and how liable we were to get trapped in the confines of conventional wisdom! Shinichi ShudoWorking with a company with a fast decision-making process like CNT was a very stimulating experience for us. Personally, I also found it very interesting to be involved in a project that could serve as a model case for Canon as it focuses on strengthening new businesses through M&A and collaboration with Canon Group companies. 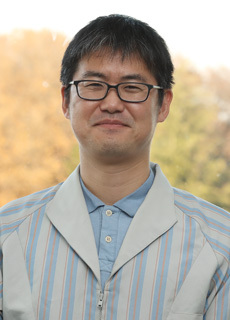 Masaki Ogasawara Electronics designer. Since joining Canon, he has built his career on developing semiconductor lithography equipment. Motto: Let’s talk about it face-to-face. Atsushi Kusaka Process developer. Has striven to increase overlay precision through rigorous performance evaluations. Motto: Be able to explain things using your own words. "If you really understand something, I think you should be able to explain it using your own words. I’m always trying to increase the breadth of my understanding, even just by a little bit at a time." The equipment you developed is a world first. You must have encountered quite a few challenges during the development process. Masaki OgasawaraWe were designing a whole new approach, so while we came to understand a lot during the development process, we also encountered a lot of things that we couldn’t understand. It really made me appreciate how incredibly deep and complex nanoimprinting technology is. Atsushi KusakaWe are working at such a fine level of detail that we encounter an increasing number of phenomena that current physics cannot explain, or things that cannot be simulated. As head of process development, I’m trying to discover the underlying mechanisms at work. Finding a new method means discovery of new things in the process. Shinichi ShudoThere is no way we could have come this far with only the knowledge gained from past projects. Compared with the development of previous lithography equipment and our initial expectations based on that experience, nanoimprinting technology is much more demanding in nearly every aspect from ventilation to temperature control, just to name a few. In order to succeed, we had to develop new technology to satisfy each of these requirements. What’s more, we ran into all kinds of unexpected issues, so we were constantly struggling to come up with redesigns. Although it’s difficult to put into practice, we became acutely aware of just how important it is to always be visualizing a design that accommodates such varied aspects as product quality, cost and space occupied. 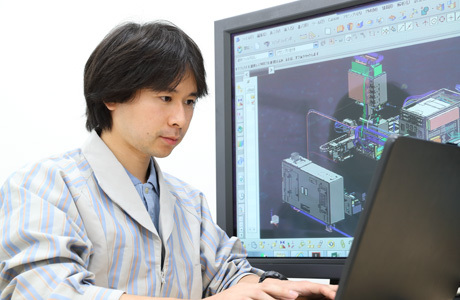 Takahiro NakayamaThrough my involvement in the development of this equipment, I learned that taking on the challenge of developing in a new field also means building a new infrastructure through the creation of such tools as measuring instruments and simulation methods. Starting from scratch means lots of hardships, but it also serves as an impetus for us to grow as individuals and as a team. How would you position the significance of having worked on the development of nanoimprint lithography equipment in terms of your careers as engineers? Shinichi ShudoIt’s truly a rare opportunity to work on a project like this, which is not only huge, but also overturns the conventional wisdom of the industry. It’s been the most satisfying and fun experience I’ve ever had as an engineer. Masaki OgasawaraWe’re working on a cutting-edge project that has generated high expectations among our customers, so it’s been a very motivating and rewarding experience for us. I’ve previously been involved in designing equipment that didn’t work out in the end, so I really want to make this one a success. 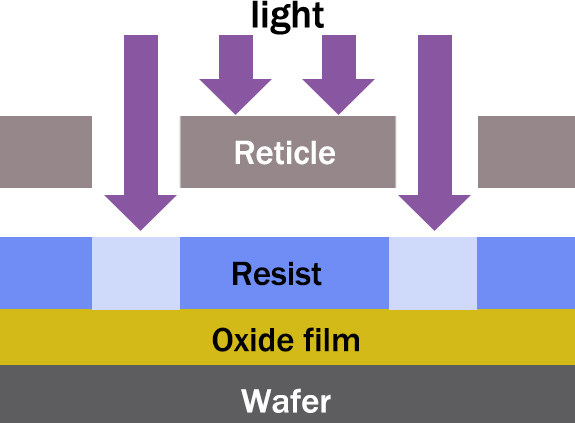 Atsushi KusakaWhen exposing the wafer by conventional methods using light, many of the issues that occur are Canon’s problem as the maker of the manufacturing equipment. When it comes to nanoimprinting, however, the contact-type imprinting method employed involves a variety of factors aside from the manufacturing equipment that can significantly affect the process. We’ve been able to solve many problems with the help of CNT and other partner companies. We’re continuously reminded of the importance of collaborating with other companies, and every day is exciting and full of discoveries. I also had the privilege of spending an extended period working at CNT in the U.S. I saw a number of eye-opening things during that time, such as the trademark speedy decision-making process of a venture company, how the contract system clearly divides responsibilities in the workplace, and how each member of their team was constantly seeking out new ways to show the fruits of their labor. It was a profoundly valuable experience for me, even changing my outlook on life. Shinichi ShudoI remember the massive slump in the semiconductor industry around the time of the 2008 global financial crisis. It’s encouraging to see how active the industry is now by comparison, and it is an honor to be able to work in the vanguard of technological development. As of July 2017, your equipment has been installed at the Toshiba Memory Corporation’s Yokkaichi Operations plant. How do you feel about that? Fine-tuning of the nanoimprinting lithography equipment “FPA-1200NZ2C” in progress at Toshiba Memory's Yokkaichi Plant. Atsushi KusakaPart of me feels like, “We finally did it!” But I know the real challenge has just begun. When you’re dealing with semiconductor lithography equipment, your work isn’t over after simply delivering it to a customer. From there, we have to make various adjustments to meet that customer’s needs. In order to successfully deliver a product that measures up to customer’s requirements, I think we need to understand their exact needs and work together with many different people to respond to those needs as quickly as possible. However, given the level of technology in this equipment, it’s unlikely we can suddenly make a dramatic improvement just by tweaking one aspect of its performance. All I can do is to rely on my experience and make small changes to improve the product little by little. Masaki OgasawaraI also feel that we’ve just reached the starting line. I feel the market has very high expectations for our product, and I want to meet those expectations. Furthermore, I think we need to make ongoing efforts to improve our equipment even after it has established itself in the market. Semiconductors are an essential part of our modern society. How does it feel to be establishing the next-generation standard for the equipment that produces them? Takahiro NakayamaWhile I know that the real test of our efforts will occur over the next few years, I’m really excited for what’s to come. I previously worked in a different research and development laboratory, but during that time, I never had the opportunity to launch a new product out into the world. With this equipment, however, we might be able to get early feedback within the year and move closer to commercialization. As of now, Canon is the only company developing nanoimprint lithography equipment for the production of semiconductor devices, so we feel our work is truly meaningful. I really hope we can succeed and contribute to society in a big way. Shinichi ShudoI believe that this nanoimprint lithography equipment will be used to create the future. Semiconductors will be so ultrafine that their applications will go beyond just being placed inside smart phones and the like. I think they will be used in all new futuristic ways like being put on stickers we can apply on our skin, or embedded in contact lenses, just to name a few. I believe nanoimprinting is the only method that will enable such applications at the low costs and fast production schedules that customers demand. Semiconductors are also critical to the development of the IoT and AI. Until recently, large quantities of hard disks were installed in mass storage devices. Now, however, data centers save massive amounts of data using cloud services, meaning their technological demands are shifting towards semiconductor memory that comes in smaller sizes while offering high-capacity storage, and runs faster while consuming very little power. People have high expectations for semiconductors. Our work will make possible their manufacture and help support a more comfortable and convenient society. Through our willingness to cast aside the old-fashioned way of doing things, and thanks to our dedicated efforts to turn an idea into a real piece of manufacturing equipment, we were able to overcome various obstacles to develop the world's first nanoimprint lithography equipment for mass production. In the years ahead, technologies like IoT and AI, both of which use semiconductors, will become an indispensable part of our lives and help make society all the more convenient and comfortable to live in. Nanoimprinting will doubtlessly play an important role in realizing such an advanced society. I was surprised at how these developers could speak so calmly about something that would be “first of its kind in the world,” without a hint of the usually over-eager tone that accompanies such statements. As I continued listening to them, it dawned on me: To these men, solving any problem that comes along is second nature. 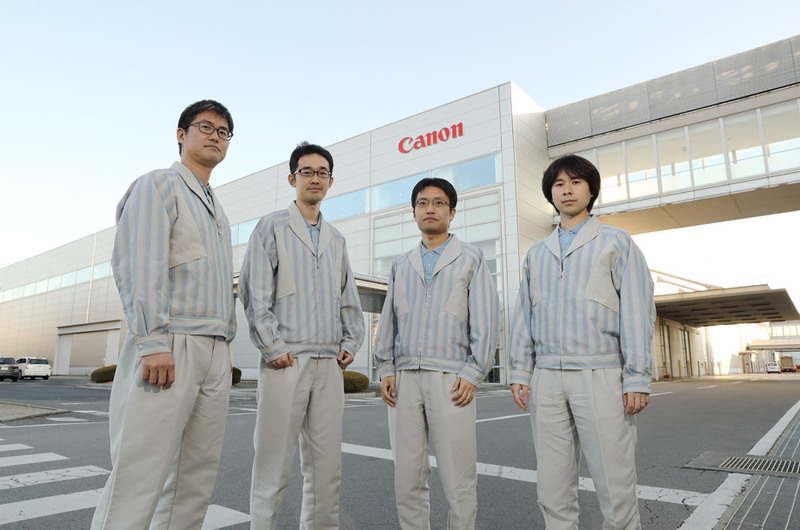 Their dedicated attitude toward directly responding to the high expectations of customers is emblematic of Canon's corporate philosophy of “kyosei” and is rooted in the “San-ji (Three Selfs) Spirit” of self-motivation, self-management and self-awareness, which has been passed down since the company’s foundation, all for the progress of industry and a more comfortable lifestyle for people--the ultimate goal. Interviewer and Editor: Kyoko Katase Born in Tokyo in 1972. Completed her graduate degree in 1998 before joining a publishing company. There, she worked in the magazine editing department as an author and editor, before beginning work as a freelance writer in 2008. She co-authored “300 Days of Radio Fukushima,” among various other publications.